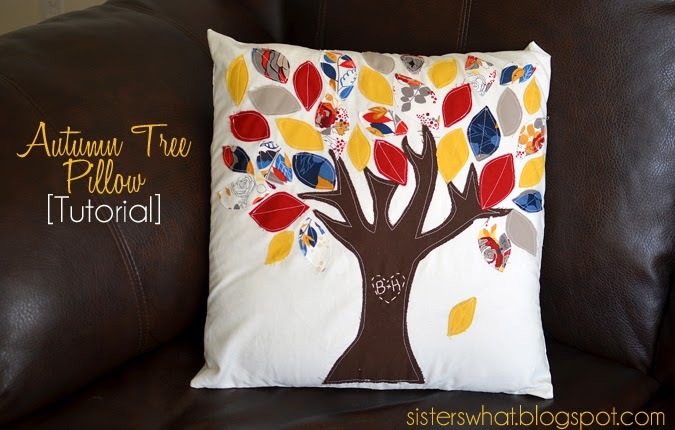 ' Autumn Tree Pillow [Tutorial] - Sisters, What! It's that wonderful time of year when the leaves are changing color and the weather calls for sweaters, scarves and hot chocolate. 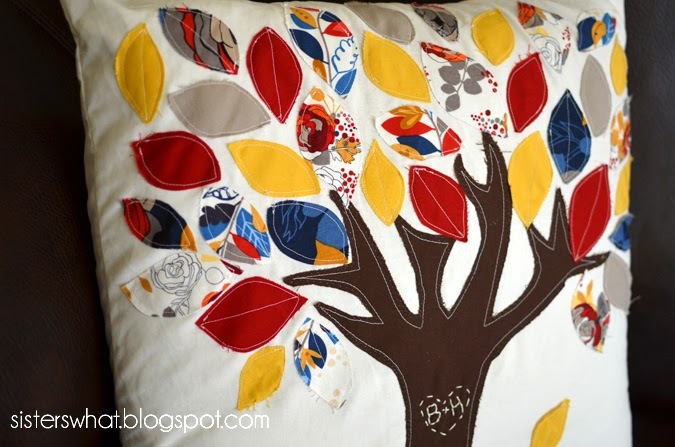 I've been meaning to make a few new pillows for our new place, so I thought that an Autumn tree pillow would be perfect! Thanks to the Ribbon Retreat, I have just the tutorial for you. I could picture it in my head, but I had no idea if it'd work and after it was finished it turned out better than I expected. Plus, it was an easy and very quick project. 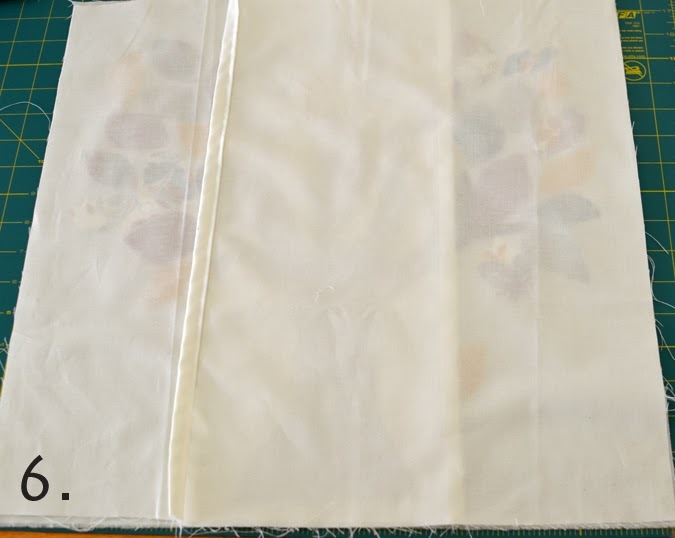 - Two sided fusible interfacing. 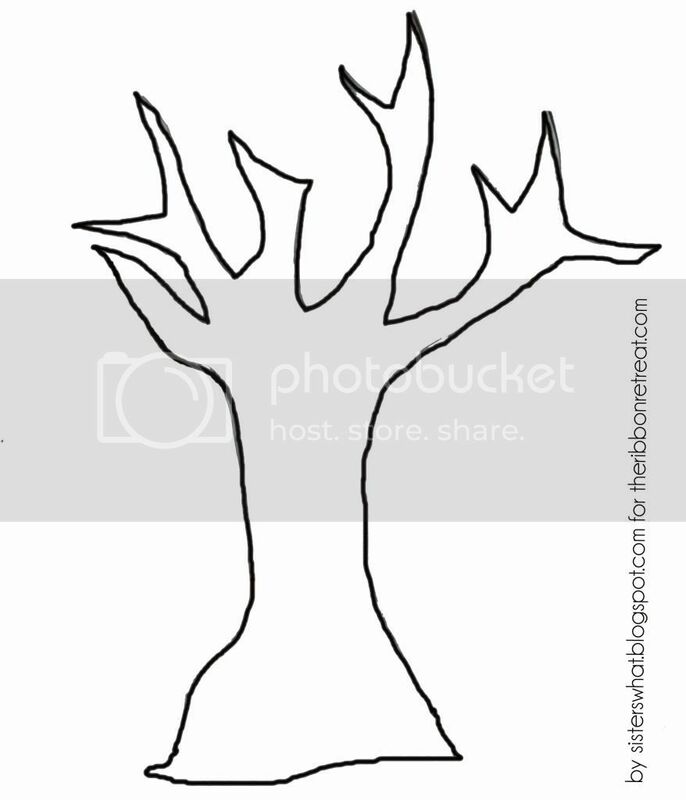 - Go HERE to download the tree template and adjust it in word or photo shop so that it fits your pillow according to the size. //1// Measure one side of your throw pillow (my pillow is 18x18). Then add on 1/4 of an inch (for the seam allowance) and cut one square. We're going to make an envelope pillow, so for the back of the pillow you will need two pieces. Cut two pieces at the same height as your pillow but only 3/4's the width. For example: if the pillow is 12x12 then the two back pieces each need to be 12x9. Now to one of the long side of each back piece finish the seam (sorry I forgot to take pictures here, but you can go here for many different examples at Sew, Mama, Sew). //2// Did you go HERE to get your tree template? After you get your tree, maybe print out a few and figure out the size you want it to be on your pillow and adjust it. 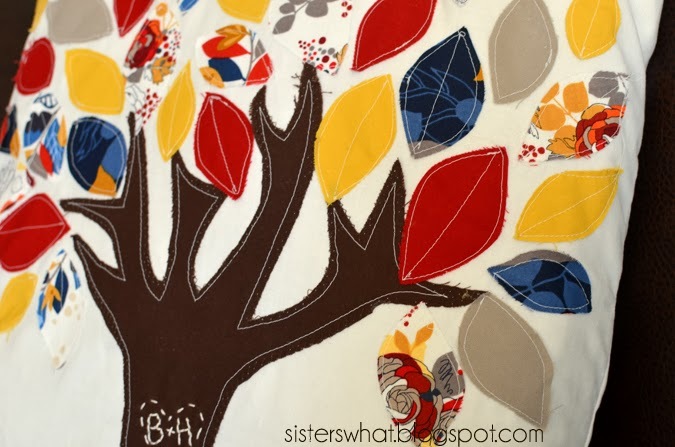 After you figure out the tree size, trace it onto your brown fabric. Now WAIT, don't cut it out yet. 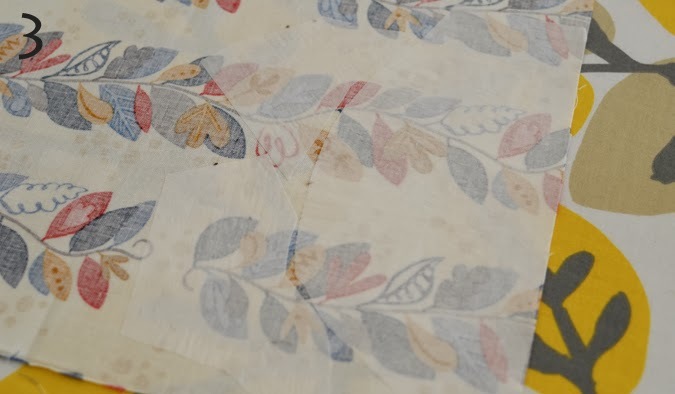 Get some of your fusible interfacing and fuse it to the brown fabric. Ok, now cut it. Now fuse the tree to the front part of your pillow. Then sew around the edge of the tree. 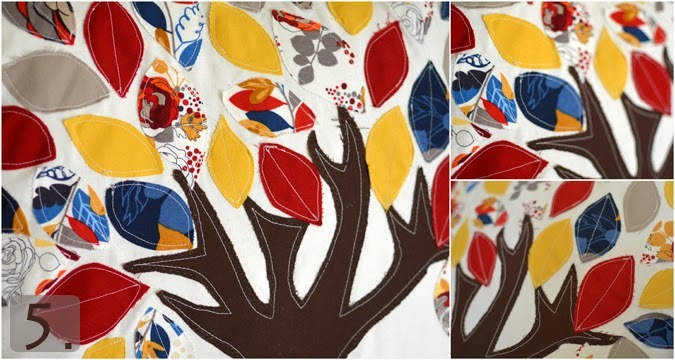 If you want, you can also sew a zig zac stitch around the whole tree in brown. //3// Now get your variety leave fabric and start ironing small chucks of the fabric with fusible interfacing. You don't need too much of each fabric; especially if you have a few different fabric to use. After you have the interfacing fused, start cutting leaf shapes out. //4// after you have them cut out, lay them out where you want them. After you have them exactly where you want them, fuse them all to the tree. 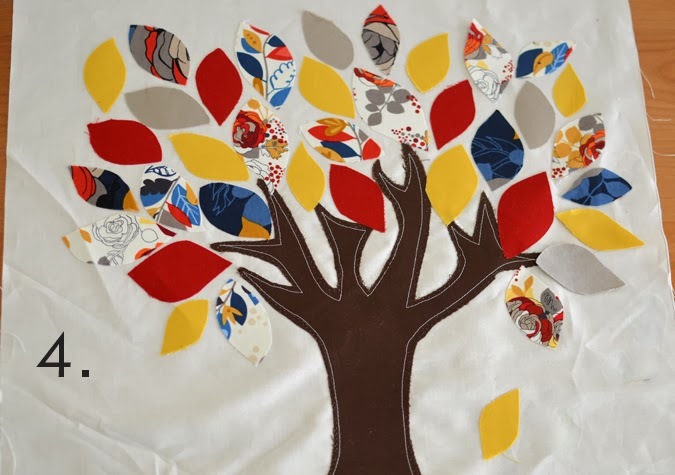 //5// Next sew each leaf to the tree by sewing around the edges. To add variety, you can sew down the center of some or even all the leaves. //6// Now get your back pieces and lay them on top of the front pieces with right sides facing together. Your two back pieces should over lap nicely. Pin them then sew around the entire edge using a 1/4 inch seam allowance. To finish the edge and make it more secure, I did a tight zig zag stitch around the whole thing after I did the straight stitch. And your done. 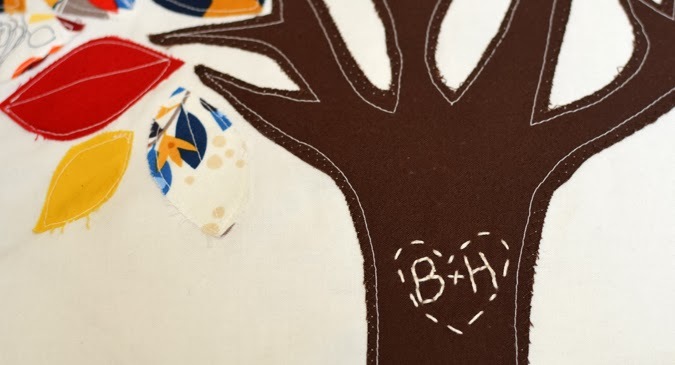 If you feel like adding a personal touch, you can embroider you and your loved ones initials into the tree. That is probably my favorite part about the pillow.